Today and even back in 2003, most baseball games and sports games in general had become simulation oriented with the goal of being as realistic as possible. While there is certainly a large audience for such games, absolute realism isn’t always what is desired. The MLB SlugFest series of games takes your typical baseball video game and adds a few arcade touches to it in order to make it a litte more exciting and fun. MLB SlugFest 2003 was available for the GameCube, PS2 and Xbox and it added several touches to your typical baseball simulation. By default, it shortens games to seven innings so that games play a little faster (though you can still play a full 9 innings if you want). When pitching, you have four pitches to choose from and can aim at one of nine points in the box but all pitches are strikes. This also has the effect of shortening the game and adding a bit of an offensive tilt to it. The pitcher also has the option of intentionally hitting the batter. This can decrease the impacted hitters stats but it can also cause that player to catch on fire which temporarily gives him unlimited turbo. Each player’s turbo meter can be used for a few different purposes. it can be used to “clear out” defensive players. Essentially charging them while base running with the goal of knocking the ball away from them so they do not get the tag. Defensive players can use the turbo meter in an attempt to prevent this. The turbo meter can also be used to run faster etc. Hitting is as simple as pitching. You simply select the spot you are aiming for and time your swing. This game generally got positive reviews and the graphics were as good as other sports games on the market at the time. The sound is also great and even includes humorous commentary. Those looking for the most realistic baseball experience will probably want to look elsewhere but for those simply looking for a fun baseball game, this is definitely one. 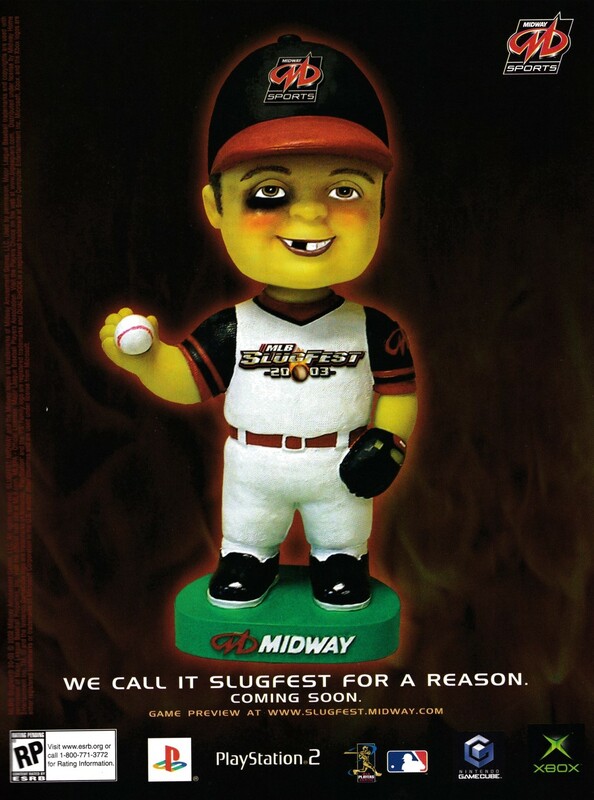 There have been several sequels including MLB SlugFest 2004, MLB SlugFest: Loaded and MLB SlugFest 2006.